new york city (brooklyn) : fabiane's cafe & pastry. as you know, on my last day in new york, we decided to spend the day in brooklyn. after a sugar crash from our experience at dun-well doughnuts, we needed some real food. enter fabiane's cafe & pastry ... a super cute little spot on the corner of bedford & 5th. "is it france? is it brazil? is it williamsburg? you decide." i think it's in williamsburg. i could be wrong. 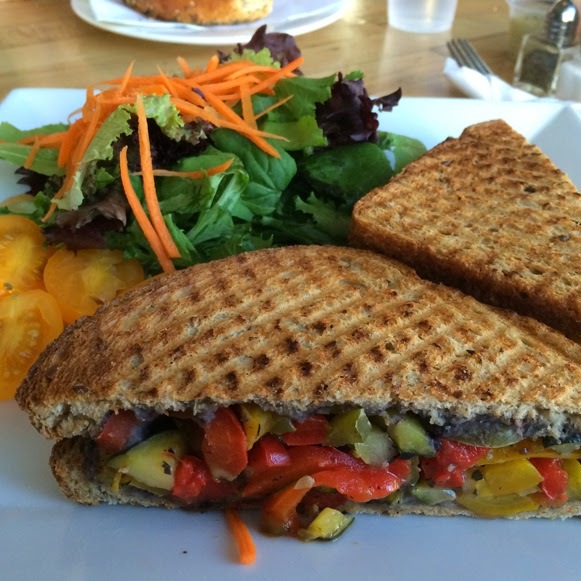 roasted peppers & zucchini w/ black bean paste on 7 grain bread & a side salad. this sammie was exactly what i needed after an all sweet breakfast. light, but filling. great flavors. and most importantly, healthy! for a quick bite, fabiane's is a great place to stop. especially when recovering from a sugar high.